Kenan Sevinc is Assistant Professor of Psychology of Religion at Canakkale Onsekiz Mart University in Turkey. He is an assistant editor for the Journal of Intercultural and Religious Studies and the Turkish Journal of Religious Education Studies. Thomas J. Coleman III is a PhD candidate in psychology at the Centre for Advances in Behavioral Science, Coventry University. He is also the Managing Editor for the Religious Studies Project, Assistant Editor for the journals Secularism & Nonreligion and Secular Studies, and is a former Graduate Student Co-representative for the Psychology of Religion and Spirituality Division 36 of the American Psychological Association. He has co-edited journal special issues on the psychology of nonreligion for Science, Religion & Culture and Psychology of Religion and Spirituality, as well as a special issue of Contemporary Pragmatism concerning different scientific approaches to understanding and explaining religious beliefs. He has published several articles and book chapters covering methodology, and quantitative/qualitative investigations of religious and nonreligious individuals. Coleman’s doctoral research explores the salutary effects of various nonreligious beliefs. Ralph W. Hood Jr is Professor of Psychology at the University of Tennessee at Chattanooga. He is a past president of Division 36 (Psychology of Religion) of the American Psychological Association. He has been as editor of Journal for the Scientific Study of Religion, the Archive for the Psychology of Religion, and the International Journal for the Psychology of Religion. He has published numerous books dealing with the psychology of religion. Psychology of religion research is typically conducted with Protestant populations living in the West. Only recently has non-belief in God become a central topic in the field. And while it remains an open question whether or not the research assumptions and theoretical frameworks designed for Western populations of Protestants can be applied to non-believers, exploring non-belief in the Islamic context may pose additional problems. For example, do Western concepts and terms such as “church attendance” or “atheist” have equivalent meaning in the Muslim world? Are there any structural differences within Islam and Christianity that may contribute to the uneven number of self-reported non-believers within these cultures? In this article, we argue that a cultural psychological approach can provide a useful perspective for researching non-belief in the Muslim cultural context. By the year 2042, the growth of the non-religious—those with no religious affiliation—is projected to reach up to 47% of the population in the United States of America (Stinespring & Cragun, 2015). In other Western countries, the number of non-believers in gods (i.e., atheists)—a subset of the non-religious—is also rapidly increasing (Brown, 2013; Keysar, 2017; Keysar & Navarro-Rivera, 2013). This increase in the non-religious and non-believers coincides with growing research on atheism from several disciplinary perspectives (Bullivant & Lee, 2012; Bullivant & Ruse, 2013), particularly in the psychology of religion (Baker & Robbins, 2012; Bradley, Exline, & Uzdavines, 2015; Coleman, Hood, & Shook, 2015; Sevinç, 2013; Silver, Coleman, Hood, & Holcombe, 2014). Between 2001 and 2012, 100 studies on atheism were conducted. 38% of these studies were conducted in the United States. When looking at the religious background of the sample, the majority (61%) are Protestant and the Muslim sample is only around 9% (Brewster, Robinson, Sandil, Esposito, & Geiger, 2014). Research on non-belief in Islamic contexts remains somewhat undeveloped (for exceptions, see Aydin, 1995; Martin, 2010; Schielke, 2012) and there are only a limited number of articles on related issues, such as apostasy, conversion, and religious doubt (e.g., Bahadır, 1994; Çayır, 2008; Peker, 1979; Zavalsız, 2010; Aydın, 1995). One possible reason for this lacuna may be that sizable numbers of non-believers within these cultures do not officially exist and cannot therefore be easily studied. Nevertheless, in an article by The Washington Post (2017), citing a variety of indirect sources (e.g., legal records requesting divorce based on the purported atheism of one’s spouse), it was suggested that there may be many more atheists in the Muslim world than often assumed. This is plausible—after all, beliefs cannot be ‘seen’ in the way behaviour can be—but there are no reliable numbers and the respective people do not admit their lack of belief. The psychology of religion is primarily concerned with how the individual navigates worldviews and beliefs, some of which may be deemed religious and others that may not be (Coleman & Arrowood, 2015; Coleman, Silver, & Hood, 2016; for opposing views on this topic, see Vergote, 1986 and van der Lans, 1986). The majority of this research has focused on Western populations, primarily within a Christian context, studying Christian individuals, and often undertaken by researchers who are themselves Christian (Wulff, 2001; Beit-Hallahmi, 2015). Consequently, investigations into non-belief (and even belief) have implicitly or explicitly adopted the literature, methodologies, and frameworks developed within this context. While this has its benefits for researching Christian populations, it is also a bane when applied to non-Christian worldviews. A cultural-psychological perspective has the potential to address these issues and help elucidate phenomena from within a given cultural context. This approach seeks idiographic, historically situated, and socially exchanged knowledge, as opposed to law-like explanations of psychological functioning abstracted from culture (Belzen, 2010). Cultural psychology has a long and visible history within the West; however it is only recently that Western scholars have been introduced to a similar history within the Islamic context (c.f., Sevinç & Ağilkaya-Şahin, 2015). As the psychology of Islamic belief becomes more salient to the West it has started to produce knowledge that challenges Western paradigms (e.g., Ağilkaya-Şahin, Streib, Ayten, & Hood, 2015). For a psychology of non-belief, however, this engagement has yet to take place. This article focuses on non-belief within the Islamic context. We raise several questions about the importation of Western concepts for describing belief and non-belief into Islamic culture and search for answers. These questions are as follows: Are the concepts of non-belief, atheism, apostasy etc. used in the same way in Islamic contexts as they are in Christian ones? Could an Islamic or Christian background have an effect on becoming a non-believer? Are there differences in religious deconversion and switching rates within these two traditions, and how might this shape an understanding of non-belief in an Islamic context? Does the structure and organization of Islamic and Christian belief systems contribute to self-identification (or lack thereof) as an atheist or non-believer? Finally, what are the overall differences, if any, regarding non-belief and non-religion between Islam and Christianity? 2. Non-belief Concepts in Islam? In this paper, the terms non-believer and atheist both mean “not a theist” (Bullivant, 2013). At the same time however, we reserve the term atheist for instances when the statement (and its equivalents) there is no god or there are no gods is made explicit, while the term “non-believer” does not require any explicit proposition. Based on Lee’s (2012, p. 132) suggestion that “non-religion,” for example, is a broader term than “irreligion”—capturing an array of positions that may be both explicit or implicit—the term non-believer is proposed as a broader category of “not a theist” than the term atheist. In Islamic literature, there are different concepts that relate to atheism. Islam basically categorizes people in terms of religious beliefs as Muslim and non-Muslim. Non-Muslims are considered “non-believers” in that they do not have the Islamic faith, but that does not mean that they are “non-believers” in a wider sense as many, perhaps most, non-Muslims believe in some gods or God. However, no existing term corresponds directly to Western notions of atheism and non-belief in Islamic literature. Atheism and non-belief, at least in the modern sense, originates in the West. Consequently, the term atheism is generally used as a “loan word” in Islamic terminology (Schielke, 2013, p. 638). In the Islamic tradition, the term kafir is commonly used as an umbrella concept referring to non-Muslims. It is used in place of more nuanced terms, such as munafiq, mushrik, ahl al-kitab, zindiq, dahri, ahl bid’ah, murtadd, and mulhid. Despite the diversity of available terms, none of them correspond to Western notions of ‘atheism’. The following section provides a summary of these terms, and explores their limited equivalence to ‘atheism’. – Kafir (infidel, non-believer, Arabic: ): In Islamic literature, the term kafir includes all concepts that refer to non-belief (Yücedoğru, 2006; Ulutürk, 1986). The word kafir originated from the Arabic kufr ( ), meaning “concealing”. Kafir is used to identify people perceived to be trying to deny or hide the truths of Islam even though they are witness to these truths. This term can only be used to denote non-belief in the tenets of Islam, and it cannot be used to imply the absence of any/all religious beliefs. Smith (1979, p. 38) also highlights that the term non-believer is not equivalent to the term kafir, because the latter always implies that the person believes in something (other than Islam). – Mushrik (idolater, polytheist, Arabic: ): This term is used to refer to people who are perceived to be worshipers of idols and other gods, as well as believing in Allah. Mushrik originated from the Arabic term shirk ( ), meaning “share”. Put in context, it means, “attributing a partner to God”. Since a mushrik is considered a polytheist, they are not a non-believer in the general sense. – Munafiq (hypocrite, Arabic: ): Munafiqs are people who are said to “look like” Muslims, but in reality keep their former non-Islamic faith or religious understanding. Again, the concept of munafiq does not identify those who are non-believers in all gods. – Ahli Bid’ah or Ahli Dalalah (heretic, Arabic: , ): The term bid’ah refers to any beliefs, practices, or dogmas that have been produced by an individual or a group that deviate from Islamic teachings. Both terms mean, “to leave from the right path”. Dalalah is similar to the term “heresy” in Christianity and also carries a negative connotation. – Dahri and Zindiq (heretic, Arabic: , ): The word dahri is used for people who have what are considered to be heretical beliefs. Groups of individuals with some forms of heretical beliefs can also be called zindiq (Kutluer, 2000, pp. 93–94). In some Muslim communities, dahr and dahriyyah refer to people who deny the existence of an afterlife and the power of God (Schielke, 2013, p. 639). Initially, the term zindiq was used for people who adopted the dualist beliefs of the ancient Persian religion, Zoroastrianism, which was and still is considered heretical to many Muslims. Later, it was used to identify freethinkers, atheists, and materialists (Ibn Warraq, 2003, p. 43). However, it cannot be said that both terms exactly mean atheist or non-believer because these terms are most closely related to heretic, although they are sometimes used for non-believers. – Ahl al-kitab (People of the book, Arabic: ): This term is used for Christians and Jews. Thus, it indicates a non-believer in the narrow sense (i.e., someone who does not believe or follow the Muslim faith) but does not indicate a non-believer in the more comprehensive sense, meaning someone who does not believe in any god or gods. – Murtadd (apostate, deconvert, Arabic: ): In the Islamic literature, the term irtidad/ridda (apostasy, deconversion, leaving religion, Arabic: , ) refers to the process of leaving the religion of Islam. The individual who has left the Islamic religion is called murtadd. Murtadd is not necessarily a non-believer in the broad sense, because the term also applies to those who have converted to other religions after leaving Islam. – Mulhid (atheist, Arabic: ): Present-day Islamic literature uses the term mulhid to mean atheist and ilhad ( ) as a counterpart to the word atheism (Schielke, 2013, p. 639). Its content does not exactly match with that of atheism (Gürsoy, 2000, p. 96) because it primarily refers to deviation from Islamic teachings or heresy (Ulutürk, 1986). According to Stroumsa (1999), from the second century AH, the term ilhad was used to describe diverse forms of heresy, that is, the denial of religion and revelation. The literal meanings of ilhad are to leave the right path, to disobey orders, and to fight and to quarrel. Ilhad means to deny the existence or unity of God, to deny basic provisions of religion, to feed or to arouse doubts about them, and to underestimate religious rules (Sinanoğlu, 2000, p. 90). Considering the historical meaning of the term ilhad, it is obvious that its content does not exactly match with that of atheism, but it comes the closest (c.f., Gürsoy, 2000; Aydın, 2007). In the West, the Baby Boomer generation born between the mid-1940’s and mid-1960’s has demonstrated a tendency to turn towards more alternative religious or spiritual paths, moving away from institutional and organized religion (Streib & Keller, 2004). Many such individuals self-identify with the survey category “spiritual but not religious” (SBNR), and while they are non-religious in this sense, they are not necessarily non-believers. On the other hand, some SBNR are atheists or non-believers, so that this population has been identified as relevant to understanding non-believer as well as non-religious populations (Coleman, Jong, van Mulukom, & Farias, 2017). If SBNR is a core concept for describing and understanding non-believers in predominantly Christian countries in the West, this raises another question for using existing language to understand Muslim populations: does the notion of a “spiritual turn” make sense in relation to Islamic populations and countries and help us understand non-belief in those contexts? In her cross-cultural research into spirituality, Düzgüner (2013b) finds that the SBNR rate in Muslim-majority Turkey is very low compared to the USA, where Muslims are a minority. However, her research has also shown that Muslims in Turkey tend to associate a different meaning to the concept of spirituality (Turk: maneviyat, Arb: ) than is commonly given in the West. Düzgüner (2013a) points out that the perception of “spirituality” in her Turkish, largely Muslim sample is behavior-based, associated for example with ‘doing good works’; by contrast, the perception of “spirituality” in the US sample is largely feeling- and belief-based, referring to, for example, ‘belief in a supreme being/ultimate purpose, and to the feeling of unity’. Altınlı-Macić and Coleman (2015) find that 41.8% of their Turkish, Muslim sample perceive “spirituality” as a religious concept. However, in the United States, Hodge and McGrew (2006) found that only 3% of their participants understood “spirituality” to be a religious concept. Extrapolating from the Turkish context, Muslims are more likely to see “spirituality” as something encompassed by religion and religiosity than non-Muslims. This overlaps with suggestions that in the West, spirituality is perceived as a broader concept than religion (Streib & Hood, 2016). In her work, Keysar (2014) focuses on three dimensions of religiosity: belonging, behavior, and belief. These dimensions cover a person’s self-identification with a religion (belonging), attendance at religious rituals and services (behavior), and belief in God. Like most sociologists, she sees these as three different facets of religion which may or may not coexist. For example, someone can identify themselves as a Jew in terms of belonging and/or behavior even though they do not believe in God (belief) (Shrell-Fox, 2015). Likewise, people who do not attend church (behavior) may believe in God (belief). Keysar has developed an eight-fold classification system taking into account these three dimensions, as shown in Table 1 below. Rate of Religious Belonging, Behavior, and Belief in the general US population (Keysar, 2014, p. 7). If someone answers a question about belonging as “yes,” they have identified themselves with a religious identity. Those who say no to this question have self-identified as non-religious, perhaps even as an atheist, agnostic, or secular humanist. Those who say yes to a behavior question may be members of a temple or church, attend services, or practice religious rituals and those who say no do not do those things. A belief question is about believing in God. According to how one answers these questions, the eight combinations shown in Table 1 are possible. In Table 1, the first group is non-believers (6% in this US study). The second group (9.5%) is those who do not profess a religious identity and do not attend religious services, but believe in God. We can call them non-religious. The third group (4.1%) is those who have only a “religious identity”. Here, religion is more of a cultural system or an identity for them, which may not relate to the Transcendent. The fourth, fifth, and sixth are rather ambiguous, and comprise less than 1% of the total sample. The seventh and eighth groups are believers, and only differ on religious behavior from one another. Here, the most remarkable point is that there is a significant distinction between belonging to a religion and belief in God. For example, Sherkat (2011) notes that many people belong to a religion but do not believe in God, and many believe in God but do not belong to a religion. Disaffiliation from religion, namely not belonging, is called apostasy in Christianity. Apostasy is disaffiliation from an organization, and is considered a defection from church membership and activities (Mauss, 1969). A person who disaffiliated from a church may continue to believe in God. Some scholars, however, have suggested that apostasy is also rejecting a belief in God in addition to rejecting affiliation with or belonging to a religion (Caplovitz & Sherrow, 1977). The differentiation between belief, belonging and practice has been developed in Western scholarship and influenced by its Christian history. It is therefore not clear whether this differentiation and Keysar’s eight-fold categorization is applicable to non-Christian religions in general, and to Islam in particular? More specifically, can belonging and belief be parsed easily in Muslim samples? To our knowledge, no study has fully addressed, or even attempted to address, these questions. Our preliminary analysis suggests that there is a stronger discrepancy between believing and belonging in Muslim-minority populations than is found in Muslim-majority populations. For example, according to the data of Eurobarometer (2010, p. 170), for European countries, the rate of those who do not believe in God or any supernatural power is 22.3%; the rate of those who self-identified as atheist is 3.4% and the rate of those who self-identify with other types of non-belief is 8%. Importantly, only half of the non-believers self-identified with a non-belief identity label, such as atheist or agnostic. This demonstrates that some individuals do not believe in God yet keep their religious identity, and even belong to a religion. For instance, in Finland, while the rate of those who say “I believe in God” is 33%, the rate of those who self-identified as Protestant is 71%. Rates of religious belonging, behavior and belief diverge in this context – and it is possible to find this picture in other European countries as well. The picture is different when one looks at Muslim countries. For example, in Turkey, which represents a unique place among other Muslim countries for having a secular government (Sevinç, Hood, & Coleman, 2017), the rate of those who do not believe in God or any supernatural power is 0.8%; the rate of those who self-identified as atheist is 0.4%; and the rate of those who self-identified with other non-belief labels is 0.4%. This shows us that those individuals who do not believe in God or any supernatural entity mostly self-identified themselves with a label of non-belief. The rate of people who “belong but don’t believe” in Turkey is very low, at only 2.5%. The rate of those who believe in God is 94.5% and those who self identify themselves as Muslim is 97%. 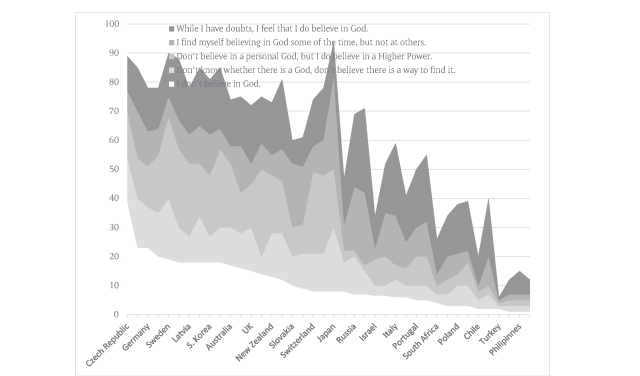 Below, Figure 1 presents all responses to the ISSP 2008 survey’s question about belief in God and/or higher powers, apart from those reporting certain belief in God (i.e., I know there is a God). It demonstrates a wide distribution across these responses in most countries; that is, there is a wide spectrum between religious belief and non-belief in these countries. Although the chart only includes data for one Muslim country (Turkey), it is nevertheless striking that these data do not demonstrate the same degree of variation in belief present in most other countries. Ideas about believing in God have a very wide range in many countries, but in Turkey, it would seem that there are really only two options: “I believe in God” and “I do not believe in God”. Percentage of the population stating some level of doubt about the existence of God (Keysar & Navarro-Rivera, 2013, p. 578). What might be some possible reasons for this? As mentioned in the previous section, atheism and agnosticism are largely of Western origin and similarly, modern concepts. The emergence and rise of modern atheism in the West was generally in conflict with Christianity. Therefore, Christianity is the first interlocutor of atheism. As previously mentioned, no term in Islamic literature corresponds easily and unproblematically to the term non-belief in the defining of atheism in a broad sense. While one should be cautious about generalizing from a single case to Islam more broadly, it is possible to see the absence of such a concept in Islamic literature reflected in this data, and perhaps other Muslim countries as well. The most widespread theistic religions of the world are the two Abrahamic religions, Islam and Christianity. This section investigates whether there any difference between them regarding pathways to non-belief? There are essentially two “paths” to non-belief. The first is to simply grow-up as a non-believer while the second is deconversion from a religion (Fazzino, 2014). Literature reviews indicate that most non-believers used to believe in God before they deconverted (Streib & Klein, 2013). Thus, the vast majority of non-believers today have a religious background. In this case, religion itself may be a contributing factor on the path to becoming a non-believer. Since being an atheist involves a rejection of the god or religion that is dominant in one’s cultural context (i.e., it makes more sense for an atheist in America, for example, to reject the Christian God than to reject the Hindu god Vishnu) initially, then, atheism is first and foremost a rejection of a single idea of God (Silver, Coleman, Hood, & Holcombe, 2014). However, one can surmise that the majority of atheists go on to reject all gods. Is this pathway the same for non-believers from Muslim and Christian backgrounds? Secondly, data show that religious background may impact the likelihood of becoming a non-believer at all, and of the type of non-belief that manifests. For example, according to data from Eurobarometer (2005, 2010), the most religious countries in Europe are countries whose majority of the population are Orthodox or Catholic. On the other hand, Keysar and Navarro-Rivera (2013, p. 565) point out that the “positive atheist” ratio, those asserting there are no gods, is higher in Orthodox and Catholic countries than others in Europe. In some studies, it has been found that non-believers have a mostly Catholic background (Smith, 2011; Hout & Fischer, 2002), and other studies have found that they have a predominantly Jewish background (Baker & Smith, 2009; Sherkat, 2008). How do Christian and Muslim backgrounds compare? Data indicate that the religion being rejected could have a great effect on rates of non-belief. For example, in the Middle East, where the majority of people are Muslim, the rate of self-reported non-belief is not more than 1%. This rate is quite low compared with other countries and regions (Zuckerman, 2007; Eurobarometer, 2005). When we analyze the proportions of religious groups by countries using the ARDA website (2014), in Table 2 we found that in 49 countries with more than 50% Muslim population, the average rate of atheists and agnostics is 1.38%; the average of the proportion of atheists and agnostics in 108 countries in which more than 50% of the population is Christian, is 6.87%. The Relationship between Islam, Christianity and Non-belief. Correlations between the ratio of people who self-identified themselves as Muslims, Christians, Atheists, and Agnostics within the population of 186 countries in the world. In Table 3, with data from different surveys (Eurobarometer, 2005; Zuckerman, 2007; Keysar & Navarro-Rivera, 2013; International Social Survey Programme [ISSP], 2008; national statistics agencies), the rate of people who said “I do not believe in God” is compared with the rates of people who self identify as Muslims or Christians in 96 countries. In both tables there is a significant negative relationship between being a non-believer and being Muslim. However, there is a significant positive correlation between Christianity and non-belief in Europe and Islamic countries. The relationship between Islam, Christianity and non-belief. Source: Eurobarometer, 2005; Zuckerman, 2007; Keysar & Navarro-Rivera, 2013; ISSP, 2008; national statistics agencies. Table 4 demonstrates that people “deconverting” from Islam primarily re-identify as a “none” (3.72%) and do not usually assume another religious identity (0.53%). The rate of those who left Catholicism is 14.92%, the rate of those converted to another religion is 1.40%, and the rate of nones is 13.52%. In Protestantism, 20.80% left their religion with only 2.48% converting to another, while 18.32% became nones. As can be seen, the number of people leaving religion is higher for Christians than Muslims. Similarly, the majority of those becoming “nones” come from Christian rather than Muslim backgrounds, though the rate of deconverts becoming “nones” rather than converting to another religion is broadly similar. Religious conversion and deconversion rates in 40 countries (Barro et al, 2010, p. 23). The 2008 International Social Survey Programme (ISSP), summarized in Table 5, asked 59,986 participants from 42 countries whether they believed in God, if this belief had changed over time, and what religion they were raised in. The proportion of atheists and agnostics who were raised in Christianity is 58.34%, and those who were raised in Islam is 0.69%. People who said “I don’t believe in God now, but I used to…”, were mostly raised in Christianity (84%) and rarely in Islam (0.41%). The rate of deconversion from Christianity to non-belief is higher than from Islam to non-belief. Rates of deconversion to non-belief in Christianity and Islam. One reason for these differences between Muslim and Christian samples may be the social pressure in Islamic countries. For example, in some Muslim countries the official penalty for atheism is death (Fenton, 2016). Therefore, respondents may not have felt comfortable openly expressing their non-belief. However, in some non-Islamic countries, where the social pressure is much lower, an individual may feel more comfortable expressing their non-belief. Above, Muslims’ who were raised in Islamic countries are compared with those raised in non-Islamic countries in terms of their belief in God. As seen in Table 6 above, the rates of people who were raised in Islam and self-identify as a non-believer (i.e., combining atheists and agnostics) is 2.51% in Islamic countries, and 6.94% in other countries. This might suggest social factors in one’s country contribute to the expression of non-belief and self-identification as a non-believer. However, social factors may not be the only reason for the negative correlation between Islam and non-belief. The religions of Islam and Christianity themselves may further contribute to this difference. To determine this, the same comparison made within Islam can be applied within Christianity. Above, the rates of non-believers who were raised in Catholicism from Catholic countries and others are compared. Comparing those who were raised in Islam from Islamic countries and from other countries. As seen in Table 7 the rates of people who were raised in Catholicism and currently self-identified as a type of non-believer is 11.71% in Catholic countries, and 29.82% in other countries. While the ratio of de-conversion in non-islamic countries (6.94%) is lower than in non-Catholic countries (11.71%), Muslims and Catholics are both about 3 times as likely to identify as atheist/agnostic living in a country where their religion is in a minority. This suggests that social factors are about the same for Muslims and Catholics. It is therefore possible that structural differences between Islam and Christianity contribute to the growth of non-belief. Comparing those who were raised in Catholicism from Catholic countries and from other countries. In the first sense, institutional or organized religion means a religion which is a social institution and its beliefs and rituals are systematically arranged and formally established. In this view, Christianity and Islam are institutional or organized religions. An institutional and organized religion has an official doctrine, a hierarchical or bureaucratic leadership structure, and a codification of rules and practices. According to Brown (2000), in this meaning, Christianity is an institutional or organized religion but Islam is not. In Islam, the mosque has no institutional structure like a church. There are no “mosque officials” or hierarchical leadership structure such as clergy or religious leaders in Islam (p. 31). In Islam, doctrines, beliefs, and rituals are traditionally transmitted from generation to generation. Thus, structural differences may be associated with non-belief from many different aspects. Apostasy and ex-communication: Apostasy is a theological concept in some forms of Christianity, and the church, as an institution, can declare an individual an apostate and even excommunicate them from the church. Apostasy in Christianity is a disaffiliation from a religious institution or organization. In Islam, there is no such thing as ex-communication because there is no institution or organization that has the power to do the ex-communicating. While some radical Islamic groups may accuse other Muslims of being kafir, according to the Quran and words of the Prophet everyone who speaks the Shahada must be accepted as a Muslim. In Islam for an individual to be labeled murtadd they must have renounced the Muslim faith. In other words, only those who have openly and explicitly professed a rejection of Islam can be considered murtadd. According to general expert opinions, irtidad can be used in the following conditions: to clearly declare leaving Islam; to deny obligatory provisions of religion; to insult something sacred (e.g., God, prophets, angels, holy scriptures) or to mock them (Okur, 2002). Irtidad is a crime in some countries under Islamic law. In others, the rule does not apply (e.g., Turkey; Azerbaijan). In other Islamic countries, such as Sudan, Yemen, Egypt, and Iran, irtidad is a crime under criminal and even civil laws (Johansen, 2003; Peters & Vries, 1976). In much the same way, atheism is a major crime in countries such as Saudi Arabia and Iran (Schielke, 2013). Thus, the Pew (2012, p. 20) survey concluded that “sectarian identities, especially the distinction between Sunni and Shia Muslims, seem to be unfamiliar or unimportant to many Muslims”. While Christian denominations are commonly separated from each other on credo, beliefs, and rituals, one of the differences between Islam and Christianity is that Muslims typically adhere to similar credo, beliefs, and rituals. For example, there appears to be a broad consensus on the core tenets of Islam (Pew, 2012, p. 7). These common practices and shared beliefs may help to explain why, to many Muslims, the principles of Islam might seem both clear and universal. Church Attendance: In Christian contexts, not going to church or not being affiliated with a church are considered kinds of non-religiosity (Mauss, 1969; Baker & Smith, 2009); the term “unchurched” expresses this disengagement. One study conducted of the so-called unchurched – in this case, those not affiliating with a Christian denomination – found that individuals’ forms of self-identification varied: humanist, atheist, secular, skeptical, scientistic, naturalist, agnostic, and anti-religious (Streib & Klein, 2013). Although being unchurched does not mean one is a non-believer (Hout & Fischer, 2002), the majority of these people describe themselves as some form of non-believer. However, in Islamic literature there is not any concept that corresponds to the concept of “unchurched”. In the Western context, religiosity is mostly characterized by involvement with a religious institution (Seidlitz, Abernethy, Duberstein, Evinger, Chang, & Lewis, 2002). This includes attendance at church services and other religious behaviors; therefore religious behavior is related to being a member of a religious institution and regular attendance (see Keysar, 2014). Going to church is an important indicator of religiosity, and as shown in Table 8, there is a significant negative correlation between non-belief and church attendance. However, as shown in Table 9, in Islamic countries, there is not a significant correlation between going to the mosque once a week and non-belief. While the average rate of non-belief is 20.6% in 17 European countries (Eurobarometer, 2010), the rate of going to church once a week is 19.5% (Hunsberger & Altemeyer, 2006). However, the average rate of non-belief is 2% in 23 Islamic countries (ARDA, 2014), and the rate of going to the mosque once a week is only 16.5% (Pew, 2012). Even the rate of attendance at Friday prayers among very pious Iranians is lower than the rate of attendance at Friday prayers among non-pious Iranians (Tezcur, Azadarmaki, & Bahar, 2006). The relationship between non-belief and going to church. Source: Hunsberger & Altemeyer, 2006; Eurobarometer, 2005. The relationship between non-belief and going to mosque. Source: Pew, 2012; ARDA, 2014. God Concept: The God of Christianity has become more anthropomorphic than the God of Islam and Judaism, which is more abstract. In Christianity, God more resembles a father figure. It has an important place in Freud’s critique of religion. According to Freud, God is an exalted, protective father figure. Freud also explains the emergence of religion with the Oedipus complex. The Oedipus complex is about one’s relationship with their father in childhood. Unlike Freud, some scholars claim that the Oedipus complex is about non-belief (Rümke, 1952; Allport, 2004; Connolly, 1980; Köse, 1997; Vitz, 2013; Allison, 1969), despite the lack of empirical support for these views. The simplest expression of this understanding is that if there are some problems with the father in childhood, the problems experienced with one’s earthly father may be directed to God, who is conceived as a father (Beit-Hallahmi, 2015). The God concept within Christianity might be related with some paths to non-belief. To be sure, in Christianity, God concepts can be influenced in a variety of ways (e.g., De Roos, Iedema, & Miedema, 2004), however there is some empirical support for a picture of God as a father figure (Noffke & McFadden, 2001). Limited research exists on this subject. However, according to Çarkoğlu and Kalaycioglu (2009) the image of God is more like a mother in Turkey, but it is more like a father in Western countries. An interesting question for future research will be to investigate not only whether the image of God in non-Christian religions differs from Christianity, but whether that difference produces meaningful differences in non-belief as well. In the psychology of religion, non-belief has only recently begun to attract attention (Coleman, Hood, & Streib, 2018). Moreover, the majority of research in this field is, in general, conducted with Christian samples and in the West. Therefore, the literature and terminology developed around non-belief are primarily connected with Christianity (Coleman, Hood, & Shook, 2015). In Muslim majority countries, such research is almost nonexistent. Yet differences between Islam and Christianity must be taken into account when studying non-belief in the Islamic context. The first of these differences is related terminology. Many of the concepts related to non-belief in Islamic terminology have no corresponding terminology of non-belief in psychology of religion. For example, atheism is not a concept that may be exactly (or even roughly) equivalent to any term in Islamic terminology. Second, perhaps the most important differences between Islam and Christianity are structural differences. Catholicism is an institutional or organized religion with a clear hierarchy and clergy while there is no equivalent in Islam, and these structural differences may impact rates of self-reported non-belief. Precisely how research on non-belief will proceed in Muslim countries is of course an open question. However, taking into account apparent differences in the applicability and use of non-belief-related terms across cultures and contexts can provide an initial starting place. Though there is a need to proceed with investigations of non-belief in Islamic contexts, it is also necessary that researchers’ maintain a critical and reflective perspective. When it comes to types of non-belief identities in the West, the number of intra-cultural influences shaping this identity is vast (Beaman & Tomlins, 2015; Blankholm, 2014; Lee, 2015). This is no less true in Islamic contexts, where religious identities are—similarly—intertwined with the politics of secularization and other cultural influences (Kuru & Stepan, 2012; Sevinç, Hood, & Coleman, 2017). But, non-belief within western countries is typically in the normative context of Christianity. For researchers investigating non-belief in Islamic contexts, however, such influences are doubled. Here, non-belief as an interlocutor faces not only the culturally prevalent influences of Islam, but also the implicit and explicit assumptions imported from the primarily Western-Christian social scientific study of religion. This makes researching non-belief within Islamic culture all the more difficult, while at the same time being all the more important. We would like to thank John R. Shook, Mike Woodruff, Emily Wade, Lois Lee, and an anonymous reviewer for helpful comments on a previous version of this manuscript. Coleman and Hood would like to thank Kenan Sevinç for the many fruitful discussions that this manuscript arose from during his tenure as a visiting scholar for 2014–2015 in the Department of Psychology, at The University of Tennessee at Chattanooga (UTC). This article was also written while Coleman was at UTC. Ağilkaya-Şahin, Z, Streib, H, Ayten, A and Hood, R. 2015. Psychology of religion in Turkey. Leiden: Brill. Allport, G. 2004. Birey ve dini. (trans. Bilal Sambur). Ankara: Elis Yayınları. Arda.com. 2014. Select Nation, Religion and Social Profile National Profiles International Data TheARDA. Retrieved 6 October 2015, from: http://www.thearda.com/internationalData/. Aydın, AR. 1995. Dini inkarın psiko-sosyal nedenleri (Unpublished Doctoral Dissertation). Ondokuz Mayıs University, Samsun. Aydın, M. 2007. Din felsefesi (10th ed.). İzmir: İzmir İlahiyat Vakfı Yayınları. Beit-Hallahmi, B. 2015. Psychological perspectives on religion and religiosity. East Sussex: Routledge. Brown, C. 2000. Religion and state: The Muslim approach to politics. New York: Columbia University Press. Çarkoğlu, A and Kalaycıoğlu, E. 2009. Türkiye’de dindarlık: Uluslararası bir karşılaştırma. İstanbul: Sabancı Üniversitesi. Caplovitz, D and Sherrow, F. 1977. The Religious drop-outs: Apostasy among college graduates. California: Sage Publications. Coleman, TJ, III and Arrowood, RB. 2015. Only we can save ourselves: An atheists ‘salvation’. In: Bacon, H, Dossett, W and Knowles, S (eds. ), Alternative Salvations: Engaging the Sacred and the Secular, 11–20. London: Bloomsbury Academic. Coleman, TJ, III, Jong, J, van Mulukom, V and Farias, M. 2017, August. What do nonbelievers believe? : Exploring the belief replacement hypothesis. In: Messick, K and Farias, M (organizers), Understanding Unbelief Symposium conducted at the 2017 International Association for the Psychology of Religion World Congress. Hamar, Norway. Connolly, JR. 1980. Dimensions of belief and unbelief. Washington: University Press of America. Düzgüner, S. 2013a. The perceptions of spirituality and its relationship to altruism: A qualitative and comparative research on blood donation in Turkey and The United States (Unpublished Dissertation). Necmettin Erbakan University, Konya. Düzgüner, S. 2013b. The intersection point of mysticism, spirituality, and religiosity: An empirical study on mawlawi sema ritual. Presented at The 2013 Congress of the International Association for the Psychology of Religion. Lausanne, Switzerland. Edwards, P. 2006. Atheism. In: Borchhert, DM (ed. ), Encyclopedia of Philosophy (2nd edition), 1. New York: Macmillan. Eurobarometer. 2005. Special Eurobarometer 225: “Social Values, Sciences and Technology”. European Commission. Eurobarometer. 2010. “Pillars of Truth: Religion and Science”, Europeans and Biotechnology in 2010. European Commission. Fenton, S. 2016. The 13 countries where being an atheist is punishable by death. The Independent. Retrieved 22 October 2017, from: http://www.independent.co.uk/life-style/the-13-countries-where-being-an-atheist-is-punishable-by-death-a6960561.html. Gürsoy, K. 2000. İlhâd. TDV Encyclopedia of Islam, 22: 96–98, Ankara: TDV. Hunsberger, BE and Altemeyer, B. 2006. Atheists: A groundbreaking study of America’s nonbelievers. New York: Prometheus Books. Hyman, G. 2010. Ateizmin kısa tarihi (trans. Dilek Şendil). İstanbul: Kırmızı Kedi Yayınları. Ibn Warraq. 2003. Leaving Islam: Apostates speak out. New York: Prometheus Book. Johansen, B. 2003. Apostasy as objective and depersonalized fact: Two recent egyptian court judgments. Social Research, 70(3): 687–710. Keysar, A. 2017. Atheists, religious and non-religious, demography and the battle between religion and science: A global perspective. In: Zuckerman, P and Shook, JR (eds. ), The Oxford Handbook of Secularism. Oxford: Oxford University Press. Keysar, A. 2014. Shifts along the american religious-secular spectrum. Secularism and Nonreligion, 3(1): 1–16. Köse, A. 1997. Neden Islam’ı seçiyorlar. İstanbul: İsam Yaynları. Kuru, A and Stepan, A. 2012. Democracy, Islam, and secularism in Turkey. New York: Columbia University Press. Kutluer, İ. 2000. İlhâd. TDV Encyclopedia of Islam, 22: 93–96. Ankara: TDV. Okur, KH. 2002. İslam hukukunda irtidat fiili için öngörülen asli yaptırım üzerine bazı düşünceler. Gazi Üniersitesi Çorum İlahiyat Fakültesi Dergisi, 1: 344–364. Peters, R and De Vries, GJJ. 1976. Apostasy in Islam. Die Welt des Islams, 17(1/4): 1–25. New Series. Pew Research Center. 2012. The World’s Muslims: Unity and Diversity. Washington. Rümke, HC. 1952. The Psychology of Unbelief. London: Rockliff. Sevinç, K and Ağilkaya-Şahin, Z. 2015. Past and Present Psychology of Religion in Turkey. In: Ağilkaya-Şahin, Z, Streib, H, Ayten, A and Hood, R, Jr. (eds. ), Psychology of Religion in Turkey, 3–30. Leiden: Brill. Sherkat, DE. 2011. Beyond ‘believing but not belonging’. Presented at the Annual Meeting of SSSR. Milwaukee. Sinanoğlu, M. 2000. İlhâd. TDV Encyclopedia of Islam, 22: 90–92. Ankara: TDV. Smith, WC. 1979. Faith and belief. Princeton: Princeton University Press. Stroumsa, S. 1999. Freethinkers of medieval Islam: Ibn al-Rawandi, Abu Bakr al-Razi and their impact on Islamic thought. Leiden: Brill. The Washington Post. 2017. http://m.washingtontimes.com/news/2017/aug/1/atheists-in-muslim-world-growing-silent-minority/ (04.08.2017). Ulutürk, V. 1986. Kur’an-ı Kerime’e göre inkar ve inkar amilleri. Atatürk Üniversitesi İlahiyat Fakültesi Dergisi, 7: 217–233. Van Der Lans, JM. 1986. Two opposed viewpoints concerning the object of the psychology of religion. Introductory statements and plenary debate. In: Belzen, J and Van Der Lans, J (eds. ), Current Issues in the Psychology of Religion, 76–81. Amsterdam: Rodopi. Vergote, A. 1986. Two opposed viewpoints concerning the object of the psychology of religion. Introductory statements and plenary debate. In: Belzen, J and Van Der Lans, J (eds. ), Current Issues in the Psychology of Religion, 67–75. Amsterdam: Rodopi. Vitz, PC. 2013. Faith of the fatherless: The psychology of atheism. San Francisco: Ignatius Press. Wulff, D. 2001. The psychology of religion and the problem of apologetics. Temenos, 37–38: 241–261. Yücedoğru, T. 2006. “Kur’an’da İman Kavramı”. Uludağ Üniversitesi İlahiyat Fakültesi Dergisi, 15(2). Zuckerman, P. 2007. Atheism: Contemporary numbers and patterns. In: Martin, M (ed. ), The Cambridge Companion to Atheism. New York: Cambridge University Press.